Imagine watching your water consumption online in real time as easily as you access your checking account or medical records. By Spring 2017 about 5,000 City of Tempe homes and businesses will have online access to their hour-by-hour water use. Tempe will continue to add more customers until every Tempe business owner and resident with a water meter can monitor their water use by early 2019. The new water meter reading system is known as "advanced meter infrastructure" or AMI. While some cities are piloting AMI systems, Tempe is pursuing the most ambitious meter conversion in the Valley. Here are five things you should know about the system. 1. A giant step: There are two common ways most Valley cities read your water meter. The first: an employee drives past each home and a computer inside the vehicle reads each meter. The second: a water department employee drives into a neighborhood, parks a specially equipped van on a street or in a parking lot, and uses a computer to read each water meter within a half-mile or so. Some cities use a combination of both of these electronic systems, which are called “automatic meter reading” or AMR. Tempe tested but never committed to either of these AMR methods. Right now, Tempe water employees still read meters the old fashioned way - by opening the lid of your water meter box (which is usually in the ground in your front yard or in the alley), checking the dial, and entering a number into a handheld computer. 2. How it will work: If your water meter is more than 7 years old, Tempe will install a new meter compatible with the new electronic system. If you have a newer meter, the city will place a new register on your existing meter. A network of “collectors and repeaters” will be attached mainly to city-owned light poles. This network will relay water use from each meter directly to a computer inside Tempe’s Customer Service Division for billing. The new system is flexible. In an emergency, such as a power or computer failure, Tempe would switch to an AMR system and each meter would be read by an employee from a specially equipped vehicle as it passes a home and business. Tempe selected a vendor to operate the system. The vendor also will be responsible for such things as system upgrades and data storage. 3. The rollout: Tempe’s 44,000 water meters are divided into four sections with about 10,000 to 11,000 meters in each. Each of these four sections has 20 routes consisting of varying numbers of meters, up to 1,000. The City will convert 5,000 meters within two sections by January. As each route is completed and tested, Tempe will notify water customers when they have the option of registering for an online portal that will allow them to watch their water use in real time on an hourly basis. 4. What the City gains: Tempe’s goals are improving water conservation and customer service. For example, monthly bills to customers are based on 30 days of water service, but that number can change. When meters are read manually, the number of days it takes to complete a route can vary because of unpredictable circumstances, such as sick days and rainy days. Adding one or two days of water usage to a bill can mean a noticeable increase in what customers pay that month. Fluctuating bills make it harder for customers to budget and often cause customer complaints and questions. The new system will provide Tempe with more accurate data within a uniform period of time, generating more uniform monthly bills. The new system also will provide data for planning purposes, such as tracking the water saved due to home and business water audits, rebates and other conservation programs. Tempe now has four regular employees and four temporary employees responsible for reading meters. Once the conversion is complete, the four regular employees will be assigned new responsibilities, such as fixing broken meters, responding to customer concerns, or completing disconnects. 5. What you gain: The AMI system helps to alert you sooner to a change in your water use. Being able to see patterns in your hourly water use gives you a better opportunity to pin point a problem. For example, if your water use is suddenly higher than usual between 5 a.m. and 6 a.m. when the irrigation system is running, you know the first place to look for a leak. Advances in technology continue to help residents use water more efficiently. Water meters are key to accounting for water used by customers and in turn can help customers find leaks quickly. 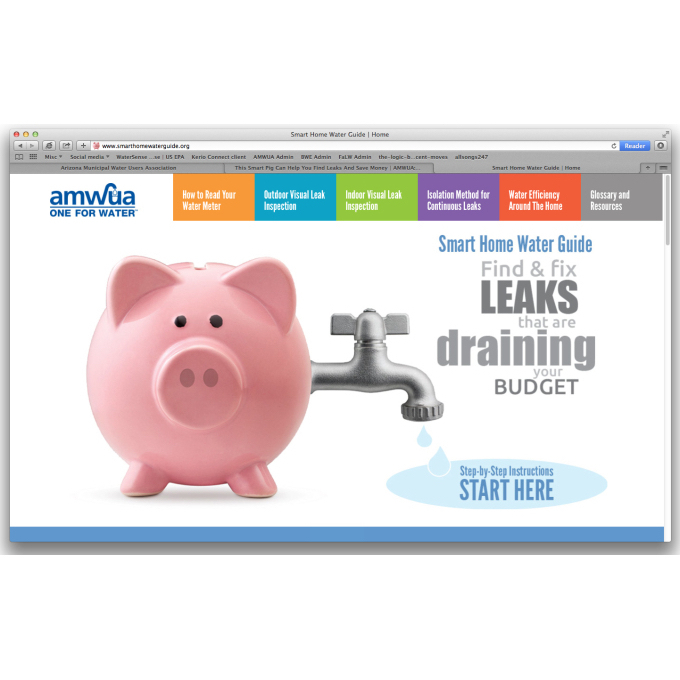 If you need help fixing leaks, AMWUA’s Smart Home Water Guide has the answers.